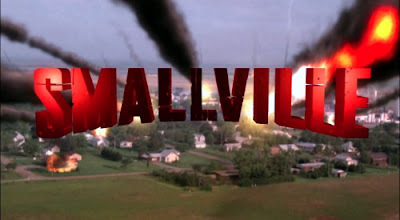 Back of the Head: Smallville 10x12 - "Collateral"
At the behest of their lawyers, Smallville is legally obligated to state for the record that no one who works for Smallville in any capacity has ever heard of the motion picture The Matrix or any its related properties. Any similarities found in this episode are purely coincidental. Also, Inception. They've never heard of that either. They have, however, heard of The Truman Show for some reason. When last we saw our Super Friends they were all knocked unconscious by a flash of light while in Egypt funeralizing their late winged wonder Hawkman. Three weeks have passed, with each member of the Justice League and Lois Lane all trapped in a virtual world created by the government group responsible for the Vigilante Registration Act. Their diabolical plan: To imprison the superheroes in a computer generated fantasy while creating a method to turn their superpowers on and off (and skills, in Green Arrow's case - how do you turn archery on and off? No matter.) at will and force them to work for the VRA. Oliver was an easy sell to Chloe; he wasted no time in trusting his girlfriend's word that they were living in a virtual world, but to be fair, the Chloe Avatar materialized out of the wall like the T-1000 before his very eyes and then shot two prison guards "dead" Morpheus-style, so Oliver had something to hang his faith on. On the other hand, Black Canary was totally convinced Chloe was the enemy. Her fight scene with the Chloe Avatar ended with Chloe stopping a knife in mid-air. Black Canary has been kind of a waste on this show. Since she's not Green Arrow's lover like in the comics, she seems to serve no purpose when she shows up besides being hostile and belligerent, then seeing the error of her ways, then going away again. However, the biggest problem in Chloe's rescue op was Clark. Isn't it always Clark? Clark couldn't believe what the Chloe Avatar was saying about the world not being real. Because Chloe left and never told him why. Clark "didn't know her anymore". Never mind all the times Clark flipped out on and abandoned Chloe for various reasons over nine years, yet Chloe never gave up on him. Clark just couldn't get over Chloe abandoning him just that once. Thus, it was easier for Clark to accept the VRA took away his super powers and he was suffering from post-traumatic stress. It took a pretty heartfelt talkin'-to by Lois to get Clark to free his mind. In the real world, Oliver is shocked to discover Chloe now runs the Suicide Squad. She had Rick Flagg and Deadshot doing her dirty work and complying as she calls the shots. Chloe's explanation for this flew over my head like Lois and Clark soaring over the Daily Planet and "the spires of Metropolis." That's right, Clark flew. Only in the virtual world, but he launched himself and Lois up, up and away, bowling over all of the Chloe Avatars corrupted by the VRA like Neo fighting all those Agent Smiths in that sequel to that movie Smallville has never heard of. The last scene of the episode was Clark thanking Lois for helping him believe he could "defy the rules of the virtual world". And who knows, Clark says, maybe he'll fly again. Smallville, we are holding you to this promise. I think my favorite bit was near the end when Clark and Chloe reminisced about their graduation from Smallville High only five years ago, and discussing the nature of trust. Who would have ever guessed that a mere five years after graduation, Clark Kent would be a mild-manned reporter for the Daily Planet, engaged to Lois Lane, and on the cusp of becoming the Man of Tomorrow? Well, everyone. But who would have guessed Chloe Sullivan would be a fugitive from the government, the former brain of Watchtower, former information nexus of the Justice League, and now the commander of the Suicide Squad? No one. Because that's ridiculous. Yet here we are.